and all shelters exceed FEMA requirements. 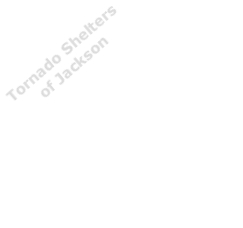 Tornado Shelters of Jackson can help you decide which shelter would be best for you. Feel free to call David @ 601.624.7718 or drop us an email and one of our representatives will contact you as soon as possible. Feel free to contact us about ordering a safe room or storm shelter TODAY! We accept Visa and MasterCard. There is no excuse not to protect your family. Don't wait for bad weather to catch you off guard! Prepare now! Features include: FEMA approved standards, heavy gauge steel construction, in-ground installation in concrete, bench seating on 3 sides, special rust resistant primer and painted interior, primed exterior with 2 coats of cold tar epoxy, fiberglass and double-welded seams by certified welders, 2 low-profile air vents, gas piston shock to assist with opening the door, quarter inch steel floor, 2 handrails along stairway for safety, 3 quick-locking inside door latches, and 3/4 inch inlet for electrical, cable and phone. Sizes:6X8 ft for 10-12 people;8X10 ft for 16-20 people; bigger/custom sizes available upon request. A storm shelter is designed to save lives in the midst of severe weather and tornado weather systems. We offer steel and fiberglass in-ground shelters set in concrete. All of our shelters meet FEMA requirements. Click here to see our Steel Shelters. Safe Rooms are becoming more and more popular for protection against storms...and with good reason! SafeHaven safe rooms are the best you can buy. Your family deserves the best! Click here to see our Safe Rooms.